Most octogenarians are content to sit in a rocking chair and maybe visit their grandchildren, but not Margrit Mondavi: “I just love to meet people and I love to remember my late husband Robert and tell people a little bit about what we do at the winery.” With a platinum blonde bob and a beaming smile, Margrit Mondavi was the highlight at the dedication of a private dining room at Modus Ristorante in Toronto recently. Margrit joined Mondavi winery in 1967 and brought “culture” on board almost immediately, with a music festival in 1969 and an art show in 1970. Her focus remains on bringing wine, food and the arts together. “I just had an art opening,” Margrit said. “It’s a new show that’s going to be on for two months featuring James Jarrett, a famous artist from San Francisco. There were 150 people at the opening party.” The next day she was on a plane to Canada and arrived at the restaurant directly from the airport. Her tour included several dinners and events in Toronto, Montreal, and Quebec City. Margrit also brought along Mark De Vere, Mondavi’s resident Master of Wine. 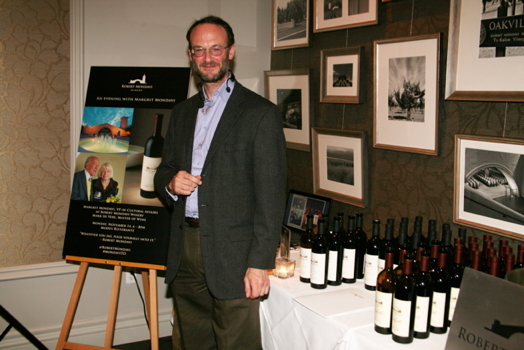 The avuncular Englishman led a tasting of the Mondavi Reserve range along with a five-course tasting menu. De Vere reminded us that in America the word “reserve” carries no official weight and winemakers can add it to any label they want. 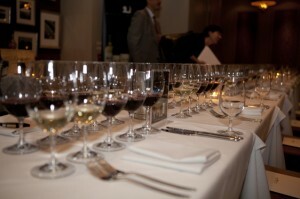 Mondavi, however, respects the European tradition of higher quality grapes and more attentive winemaking for the reserves, including hand sorting of the grapes. The three tiers of Mondavi are Napa Valley at entry level, District wines from specific vineyards (e.g., Oakville, Stags Leap), and Reserve at the top. 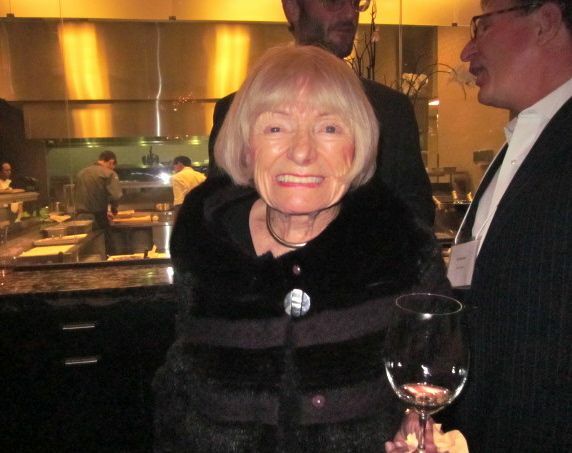 Margrit Mondavi has been in Napa long enough to know it is all about the Cab. “The best Cabernet Sauvignon has the tenderness of a baby’s bottom and the power of Pavarotti,” she said. My favorites of the tasting were the two Cabs, especially the pricier one. Mark De Vere told us that almost all the grapes for the Cabernet Sauvignon Reserve are sourced “from the best blocks” of To Kalon vineyard. Like a Burgundy grower praising a prized hill, De Vere said To Kalon consistently delivers “more complex and distinctive wines.” The earliest of the current plantings date from 1945 and include some of the oldest cab sauvignon and sauvignon blanc vines in California. One thing that is clear is Mondavi wines of today are bigger, fuller and, most strikingly, more alcoholic than in the past. I got to try Mondavi Cabernet Sauvignon Reserves from a number of different years at another fine tasting hosted by Mark De Vere three years ago. The 2008 Oakville and Reserve Cabs weigh in at 15.6 and 15.9 percent alcohol, respectively. By comparison, the 1987 Reserve was 12.9%; the 1993, 13.8%; the 2001, 14.6%. A knee-jerk reaction might be to cry “global warming,” but Napa was hardly cool in the 80s. At that tasting in 2008, De Vere said “we just don’t know why,” and pointed out that wines made after hot summers twenty or so years ago had lower alcohol levels than wines made after cooler summers recently. I paired the Reserve with roasted venison loin with smoked bacon jus and sour cherries and it was electrifyingly good: a tasty reminder that few wines are better with game than a rich, fruity Napa Cab. Another wine that got raves was the Fumé Blanc Reserve 2009, which is a blend with 8% Sémillon—very Bordeaux! The rather oaky nose has a good amount of white fruit, a grassy hint and a citrus note. Then it’s super fresh on the palate, which is fuller bodied and more tropical in the fruit dept. Cedar/oak notes are evident yet work well and there is a nice rich finish. De Vere reminded us that Robert Mondavi coined the name fumé blanc in 1968. Sauvignon Blanc in California had previously only been a sweet wine and he wanted to differentiate his dry version. His original inspiration was Pouilly-Fumé from France’s Loire Valley. Mondavi took one of the local names for the wine—“blanc fumé”—flipped it around, pumped up the oak and created a new style of Sauvignon Blanc. All of the grapes used in the Reserve come from the To Kalon vineyard. For Mark De Vere, this wine “is best between five and ten years of age.” I could see potential benefit in greater integration and a general toning down, so maybe hang on to it until 2015. The Reserve Chardonnay 2008 was full, creamy, toasty, and smoky and the Pinot Noir Reserve 2009 was rich, dark, and fuller bodied in that California style. Alan McGinty is a writer and editor based in Toronto. In addition to taking the London-based WSET program to Advanced level, he has visited many wine regions including Bordeaux, Rhone, Rioja, Napa, Niagara and Okanagan, among others. He has a regular blog atWinefox.ca and his work appears in other Canadian-based web and print publications, invariably focused on his principal interest: wine. Before I got to ask him for his 2011 views on alcohol levels, Mark De Vere left on a month-long trip to China and his autoreply noted “limited access to email”. He’s still away and wasn’t able to update his views before the story went up, so I spoke to Genevieve Janssens, Director of Winemaking at Mondavi, who says a few reasons for the higher alcohol levels have been established. New, more robust rootstock planted since the late-80s, more widespread use of drip irrigation and generally healthier vines mean that sugar levels become high before ripeness is achieved and they continue to rise while the skins mature. Higher sugar levels in the grapes mean higher alcohol in the wine. The weather is still important though: Janssens added that this year was cloudy and cooler in Napa and she expects the 2011s will be back in the 14% range.